"New Ceramics Out of Brunei Darussalam: Dr. Geiger-Ho's Reconstructed Landscapes" is a studio-based exhibition of ceramic sculptures made from local clay found on the Universiti of Brunei Darussalam (UBD) campus, and the nearby location of Berakas Beach recreational park, Brunei Darussalam. Geiger-Ho's solo exhibition represents a body of work that can be, through its material, connected to Brunei's creative industries. Geiger-Ho's exhibition is intended to be a teaching model for her ceramic and sculpture students because she uses both her pottery and a special teaching display as a means for introducing the concept of using found clay, as opposed to processed commercial clay, to produce art. Furthermore, her exhibition also includes digital photography intended to accompany her special educational models, which showcase the physical resources and outcomes involved with processing raw ceramic materials into fired clay articles. Geiger-Ho considers all of her exhibited work, from her semi-functional bowls, to her sculptural pieces, to be experimental works because each object was fashioned from a small batch of hand gathered and prepared clay that yielded new and slightly different and unpredictable results. Also, instead of using commercially blended clay that would offer consistent results every time, Geiger-Ho chose to work in a less predictable manner because she wanted to pay homage to the landscape that yielded the clay that was gathered one small bucketful at a time. By touching and experiencing each small landscape area that displayed a different kind of clay, Geiger-Ho became familiar with the qualities of that place and then worked towards using her precious ceramic materials to their full advantage to make sculptures and wheel-thrown vessels that resonate back to the character of their original location. 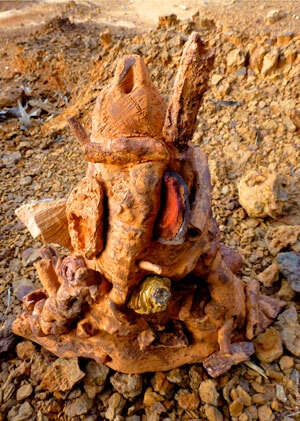 This is why all of the work in her exhibition has a rugged, natural quality to it. In conclusion, Geiger-Ho believes that a greater understanding of pottery and the art of its production as a means of personal expression, can be better understood and appreciated if both collectors and makers of it, understand its relationship to its place of origin and its importance as part of the study of geology. 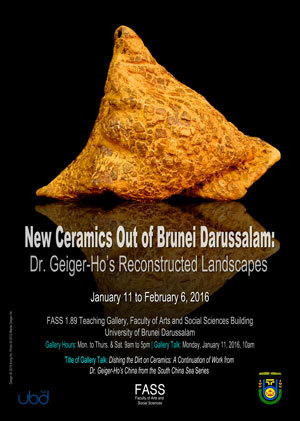 New Ceramics Out of Brunei Darussalam: Dr. Martie Geiger-Ho's Reconstructed Landscapes Exhibition, FASS Teaching Gallery, University of Brunei Darussalam, January 2016.